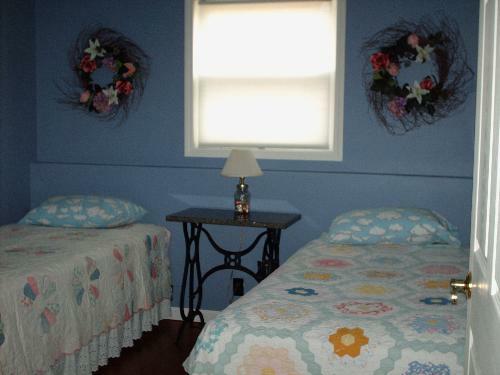 These retreats are “knot” just for quilters, although as an avid quilter, they have been designed with quilters in mind. Either retreat will be great for all fiber artists….scrapbookers, spinners and weavers and of course, quilters. If you are looking for a place for a big girls get-a-way…..look no further. 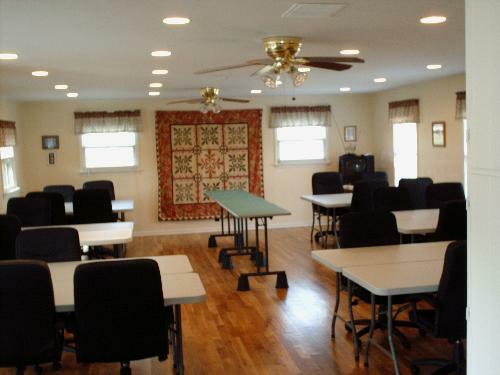 We have two individual houses to accommodate groups. 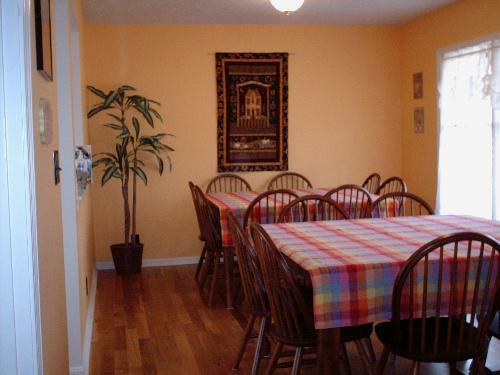 Pieceful Haven Retreat will accommodate groups up to 18 and Sew Pieceful Retreat will accommodate up to 10 people. Both homes have a homey, comfortable feel with a studio with excellent lighting, 6′ tables with nice, comfortable chairs where you can work til you just can’t work anymore. There are cutting tables with Olfa Mats and acrylic rulers as well as irons and ironing boards for your use. There are also 36″ square individual design walls and a 8′ x 8′ design wall. There is a NO SMOKING AND NO PET policy in each house. The studio has a 42″ flat screen with a Blue Ray dvd player and stereo for your entertainment. We have DirecTv with Internet and Wi-Fi capability. There are three bedrooms and two baths on the first floor and five bedrooms and two baths on the lower level. This retreat will accommodate up to 18 fiber artists. 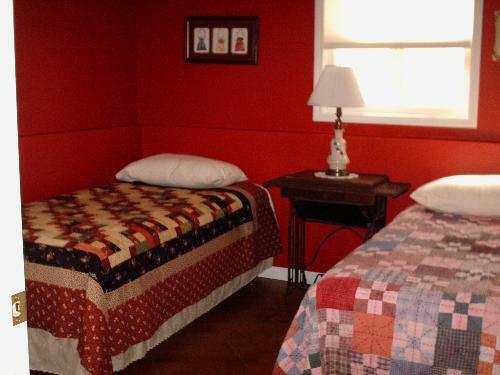 There are two or three twin beds in each bedroom. There is a fully equipped kitchen for you to prepare your meals, a dining room, and a sunroom with four extremely comfortable recliner chairs. The huge deck on the back of the house, with seating for 18 and a gas grill for your use, overlooks the wooded area where the wildlife can be enjoyed. We have installed a ramp to make bringing all that ‘stuff’ into the house so much easier with your roller carts. When you reserve this home, you will have the entire house for your group. The studio has a 42″ flat screen tv, dvd player and stereo with i-pod dock. DirecTv and Wi-Fi are also available. This retreat has three bedrooms; three twin beds in two rooms and four twin beds in one bedroom. This retreat will accommodate up to ten fiber artists. There are two bathrooms, a kitchen fully equipped to prepare meals, with an open dining area adjacent to the studio. You will also enjoy the cathedral ceiling with three skylights in the studio that give great natural lighting. There is a covered front porch with swings to enjoy the outdoors. When you reserve this home, you will have the entire house for your group.